Ralph with Mr. C after their recital last May. 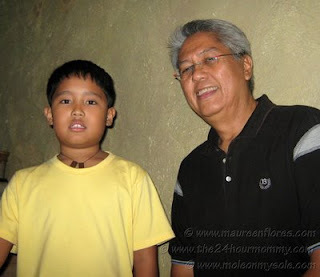 My son had a very good experience joining the 14K Program of the The Music School of Ryan Cayabyab last summer. He enjoyed his summer music lessons so much that he finally accepted our offer of enrolling him in individual music lessons. TMSRC is offereing individual music lessons in Voice, Piano, Violin, Guitar (acoustic and electric), and Drums. As of this writing, the tuition fee is at Php 5,200 for 10 lessons. Each lesson is only at a 30-minute duration and meetings are done once a week. If you are also interested in enrolling your child in any of the courses above, you may visit them at the Lower Level of the Park Avenue in Robinson's Galleria. You may also call 637-9840 for more details. This is a wonderful opportunity for your son. i wish there are such good schools near our place!